The term chitosan refers to a family of polysaccharides obtained by partial de-N-acetylation from chitin. Chitin is found in the exoskeletons of insects and crustaceans such as shrimp and crab, in the endoskeletons of mollusks such as squid, in many invertebrates as in the cell walls of fungi and some diatom algae. Chitin is the only fully biodegradable amino polysaccharide produced by biomass. Chitosans have a number of commercial uses according to their characteristics (water treatment, agriculture, cosmetics, medical applications). In agriculture low molecular weight chitosans help the plants to develop their immune system to make them more resistant against biotic and abiotic stress, and some chitosans are showing eliciting effect on plant growth. In biomedical applications, high molecular weight chitosans are used for their haemostatic and wound healing properties and also have been proved to be a good support for animal cell cultures in tissue engineering. Also, some chitosans have bacteriostatic and fungistatic properties against microorganisms, which is useful in agriculture as well in medical applications. The company Mahtani Chitosan is located in Veraval (Gujarat, India) and is one of the major producers of chitosan worldwide. They produce chitin and chitosans on large scale, mainly using shrimp shells from wild catch as raw material. In order to build separate life inventories of chitin and chitosan we need to define what type of co-production we are dealing with. As soon as we learn that chitin is the raw material for chitosan production we can state that we are facing a case of combined production, since Mahtani Chitosan can adapt the output of chitosan and chitin co-products depending on the demand for each of these materials. If demand for chitosan increases, they will sell less chitin and use it instead to produce more chitosan. Based on this, Mahtani Chitosan can provide an accurate account of the activities involved in either chitin production or chitosan production, so that we can apply subdivision and thus avoid allocation, as prioritized by ISO 14044. Of course, subdividing might not always be straightforward. While some activities can be easily attributed to chitin or chitosan production, other activities and therefore their associated burdens are common to both. An example is land occupied by offices and workshops. In such a case allocation to chitin and chitosan based on mass is an option to solve the problem. 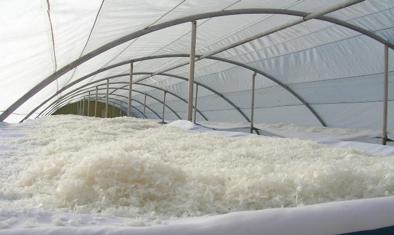 Figure: Shrimp-derived chitosan drying in a greenhouse. Picture: Dominique Gillet. The main source for this example is a case study on chitosan production, carried out for the EU-funded project Nano3bio (http://www.nano3bio.eu), where Mahtani Chitosan (http://www.chitinindia.com) is among the producers assessed. Unfortunately the case study itself is confidential.